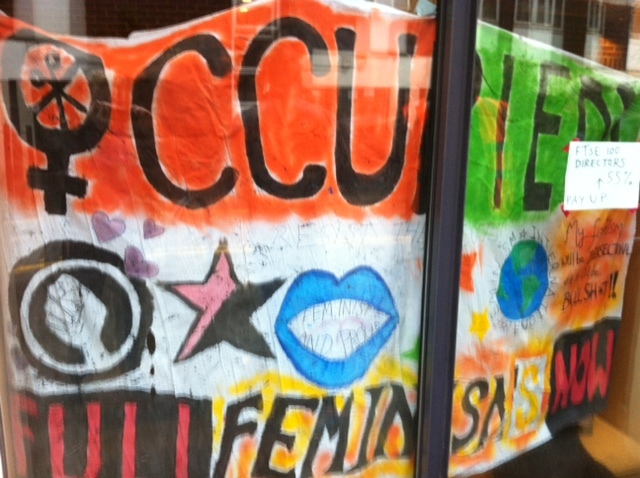 The occupation is part of a growing wave of feminist anger against the government’s austerity regime. Banners hung from the occupied building highlight the effect the cuts are having on women, such as the nearly 30,000 women turned away from refuges last year due to lack of space. The occupation was planned to mark International Women’s Day, ironically the day The Women’s Library exhibition ‘The Long March to Equality’ was due to end pending the building’s closure. For more details on the gendered impact of the cuts, read TUC’s document ‘Gender Impact of the Cuts’ or the Fawcett Society’s ‘The Impact of Austerity on Women’.